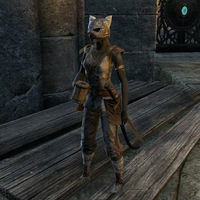 Sha'ad is a Khajiit thief found speaking to Quen in an Outlaws Refuge or in Abah's Landing at the start of the quest Partners in Crime. She does not have any dialogue; she merely listens to Quen's proposition and goes over to talk to Glaz afterward. Sha'ad will not show up if you start the quest from the Collections tab. This page was last modified on 8 January 2018, at 02:26.